I'm back with y'all after surviving my first and second week of student teaching. I have to admit, the weekend before my student teaching began, I got a cold. I was over it by Monday though, so I thought I was in the clear! The weekend after my first week was completed, I got a stinkin' cold again! So I decided that I needed to relax and recharge, enter my nightly pamper routine. When I come home from school, first things first-I change into comfy clothes! I get some housework done, any school stuff, and then start supper, all while wearing my favorite high school sweat pants and an oversized sweatshirt. Hashtag glamorous. After supper is finished and Chris and I have had time to eat and see each other for a bit, it's time to pamper myself! I love to turn on my shower and some music on my iPhone. The heat, steam, and my favorite Spotify playlist-Country Coffeehouse help me unwind. 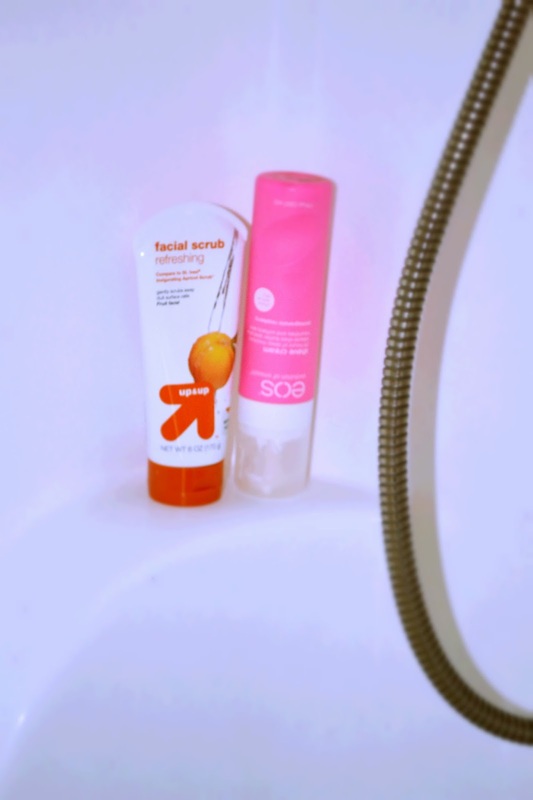 In the shower I love to use my Target brand apricot scrub and my EOS shave cream. The best part of the shower though, is my Macadamia Oil shampoo and conditioner by HASK. The shampoo and conditioner are so moisturizing and that's a must for my dry and brittle hair. Winter is tough on my hair, but dressing up every day (aka having to heat style my hair) is also really rough on it. This shampoo and conditioner duo have become a staple in my shower since it's first use. I finish up my shower with my favorite seasonal body wash, currently Twisted Peppermint by Bath and Body works. If I'm feeling extra special, I'll use the deep conditioner by HASK. It's super moisturizing and you let it sink into your hair for about ten minutes before rinsing out, the perfect amount of time to shave your legs or just relax. I also utilize my shine oil treatment on nights when my locks are feeling really neglected. You just apply a dime sized amount and run it through your hair, no rinse required! 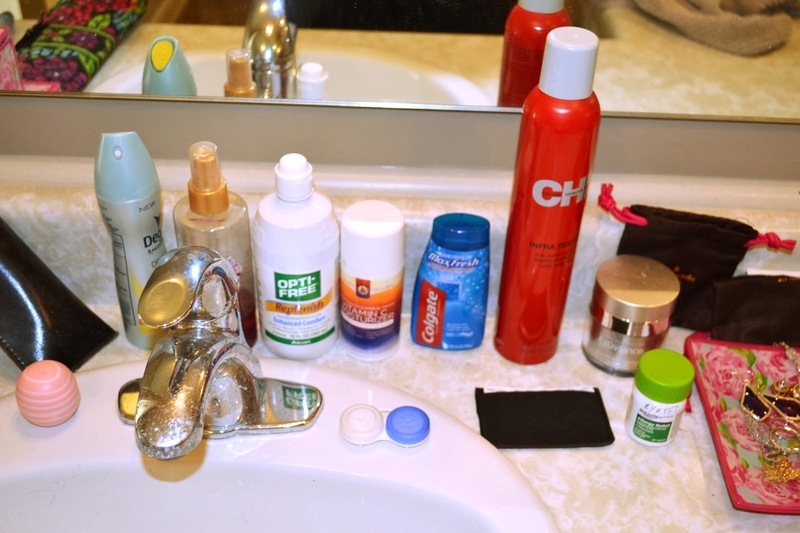 After my shower, I head over to my vanity where I take off any leftover makeup. I'll comb out my hair and then moisturize using my favorite spray lotion. Next is my favorite part of my pamper routine, but the part that I don't do every single night. Exuviance products are an all time favorite for me. 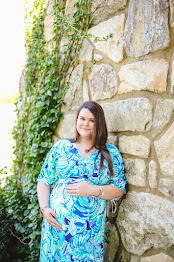 They are well known and respected for all the research they do to create the best products. These products do sit at a higher price point, but there is a reason for that-they're just that good. Case in point; after many years spent out in the sun tanning (& sometimes burning) and teenage acne, both have left me with darker spots on my skin. Plus, on top of that I do typically wear makeup most every day (you would too if you worked around teenagers!) and that combined with harsh winter air has my skin really dry. 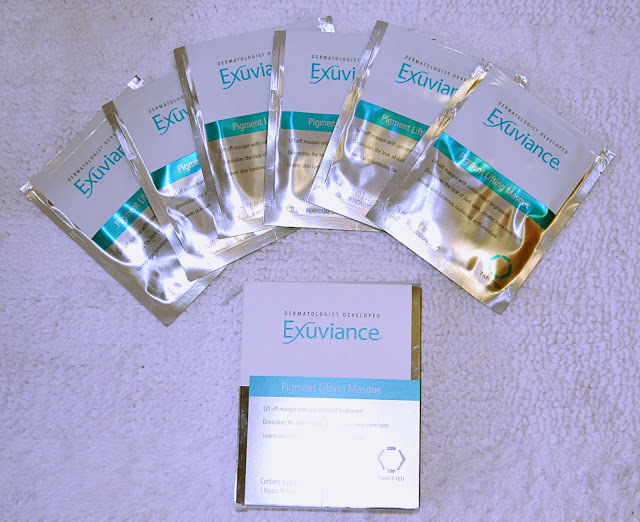 The Exuviance Pigment Lifting Sheet Masks fit really nicely on my face and I love that they are packaged individually so the product doesn't dry out. Oh, and these masks are packed with product-they aren't dry at all! Basically, to use them you just tear open the packaging and lay the mask on your clean, dry skin. It isn't sticky so it almost forces you to lay back and enjoy relaxing for 10-15 minutes. Of course, I leave my Spotify on and usually light my favorite candle while I relax...currently it's Mahogany Teakwood. I can't believe I'm showing y'all this, but here is a shot of how the mask looks on. . . I hope y'all enjoyed my little pamper routine, I know I love to do it when I have the chance. How do you pamper yourself? Let me know below! A big thank you to Exuviance and HASK via BrandBacker for providing me with product in exchange for an honest review. All opinions are my own. Thank you for supporting brands who support The Southern Stylista. A nightly pamper routine sounds perfect, and yours sounds super relaxing. I haven't really had the time to do anything like this for a while, but back when I was an undergraduate and had much more (underrated at the time) free time, I used to take weekly baths where I would just light a candle and read while soaking in some wonderful Lush products. Anyway, student teaching can be demanding, so pamper yourself often! Girl you deserve a nice pampering about student teaching! What a great routine! I normally take a bubble bath while reading a good book, and then after I love to use shea butter lotion after! Pampering is definitely much needed after a day of student teaching! I just tried Hask conditioner for the first time, and it is AWESOME! I need to take more time at night to pamper myself, but I'm usually so exhausted at that point that I'm doing all I can to wash my face, throw on pjs, and fall in the bed! Night routines like this are so important to recharge and prepare you for the next day. Love it! This sounds like an awesome routine! I love trying new masks, it is such a great way to pamper without spending a fortune at the spa! If I had a Million Dollars. . .